Mankind has gone to great lengths to explore space. It is a natural curiosity that has led us to build incredible machines and push the boundaries of what we thought was possible. 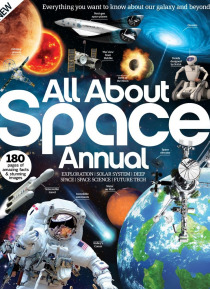 In the All About Space Annual Volume 4, you'll find a collection of the best articles from the last year of All About Space magazine. From the incredible space experiments and record-breaking astronauts to multiverse the… ories and the hunt for wormholes, this is the perfect book for any space fan. Featuring: 50 greatest discoveries of all time - The most astonishing advances is space science as chosen by readers. Are we alone in the Solar System? - Can our neighbourhood provide the answer to the quest for alien life? Think you know our Sun? - We’re still in the dark when it comes to knowing everything about our star. What happened before the Big Bang? - Was there a time before the birth of the universe?